What's your Desktop look like? The Mossmouth Forums > General > Discuss! (Moderator: AresRomanGod) > What's your Desktop look like? Alright, I didn't see this thread anywhere on here, so I think its time for one. What does your background look like? Here's mine. Re: What's your Desktop look like? I would so you mine, but you don't want to see. Saying that makes the reverse even more true! Never showed it off before, but why not huh? Dur, I could have cropped it, there's nothing on the right side. You guys' are cute though! 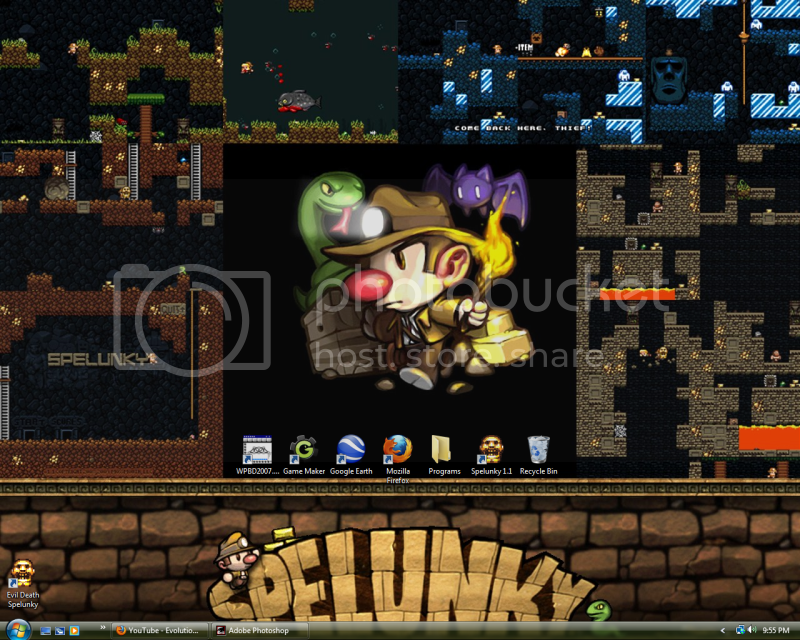 Awesome Spelunky collage. cave story? nice. I would like to know more about some of the games you have there. Morrowind and Oblivion, MGG you must download/buy those. They are amazing IMO. By the same people who later made Falllout 3 (which is just a futuristic Oblivion with guns). The construction sets (known as TES CS and the like) let you edit the game to an amazingly fun degree and are helpful to let even beginners make mods. The games themselves are action-rpgs of the western variety, the latter (Oblivion, which is number 4 of the series of Elder Scrolls games, Morrowind number 3, the first 2 I haven't played but are supposedly not that bad) being more action-oriented and newbie-friendly. OBSE and OOO are for Oblivion mods. American McGee's Alice (or as you have it, Alice) is a darker version of Alice returning to Wonderland, where the Queen is a horrible tyrant. It's rather run third person shooter-ish thing (I'm not to good with describing genres) but the controls are a bit off. You should already be well aware of Nethack and La Mulana. Possibly even Doom Roguelike (or that's what I suspect it to be). Painkiller is your generic FPS in the style of Serious Sam whereupon you shoot lots of demons swarming in hordes, I beleive. Said to be fun, but I have yet to try it. Though I suspect you to know most of what I told hope I was of some help MarsGreekGod. 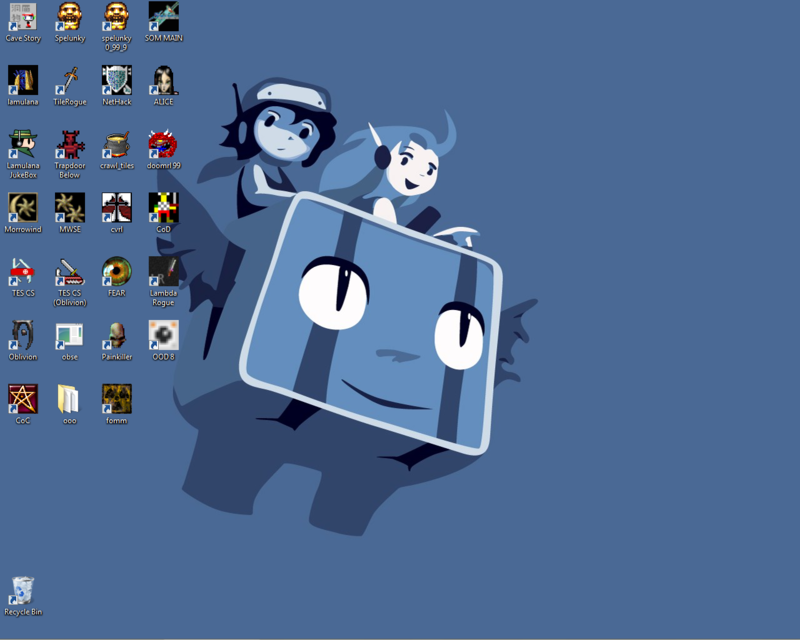 My Desktop is in the Process of being made but Arucard, thats quite a Collection of games there. I'm disappointed in the lack of Dwarf Fortress though. All those rougelikes and you don't have Dwarf Fortress. Currently my Desktop is a picture of my Nephew but thats going to be changed. I'd post it up but its a little personal. Thank you glennrieck. I already know of morrowind and oblivion, but saddly don't have them as of yet. I have heard good things about fallout, but never played any of them. I have seen mods for morrowind however that I quite liked. I did like the speed run of the game in less then 10 mins. alice? ah so that what it is. I may look it up. serious sam? I must say my know how of FPS's are somewhat... lacking to say the least. It's worth a buy. Serious Sam is an FPS where you...well...shoot things. LOTS of things. All attacking at once. I've not the chance to play but that's what I've heard of it. Hmm.. interesting. I don't think I can really justfe buying a game when I bought 6 over xmis however. I keep my desktop sparce, since I mostly just use the quick launch stuff. It's much more convenient. This is my current background as of the moment but is subject to change. I think I well post my desktop when I get home. I change my background every week..